The Lap-Chee Dance Team is delighted to present the complimentary STREET DANCE WORKSHOPS on Sunday (30/10 & 6/11) at 6:00 – 7:30pm. Limited places will also be open for non-members on first-come-first-serve basis. This semester we will have 2 sessions with Nicole on street dance (e.g. basic dance skills, hip hop, jazz funk and urban dance). * Dance team members will have priority to participate, while limited places will be available for other residents on first come first serve basis. Please sign up on https://goo.gl/L6I9Vv to reserve your place! 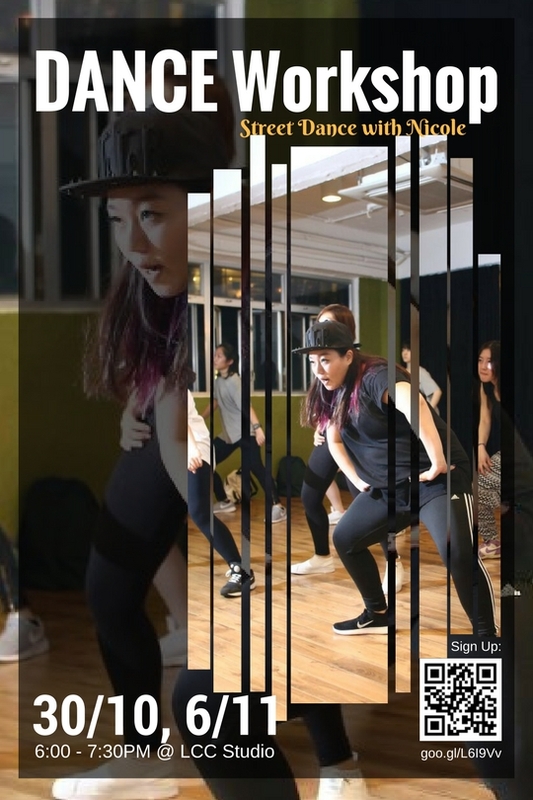 Nicole Tsang is a dance tutor at Neverland Dance House (Kwun Tong/ Sai Ying Pun), specialising in Jazz Funk and Hip Hop Dance. She has taken part in various dance competitions and performances, and received training in Singapore. In 2015, Nicole was featured in local artist Joyce Cheng’s hit song “你瘦夠了嗎?”, which challenges conventional concept of body image and weight control. Being a plus size dancer herself, Nicole has also shared with various magazines and medias about the difficulties she has faced in field.